The North Green and the Leroy Anderson Memorial Bandstand are located at 11 Main Street South. They are owned by the Town of Woodbury. The Woodbury Lion's Club built the bandstand in 1986. The Pomperaug Valley Garden Club installed and maintains the Eleanor Anderson Memorial Garden surrounding the bandstand. The North Green and adjacent buildings are all within Woodbury's Historic District No. 1 and are on the National Register of Historic Places. The North Green is a triangular Park/Green along Route 6 in what was historically known as North Woodbury. The North Green is located at 11 Main Street South in Woodbury, Connecticut. The green is bounded on the West by US Route 6 (Main Street), on the North by Pleasant Street, and on the East by Green Circle. 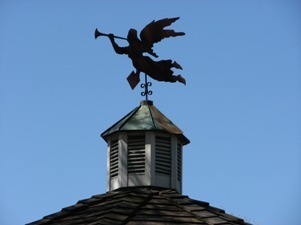 The North Green is owned by the Town of Woodbury and is situated within Woodbury's Historic District No. 1. The green and the surrounding properties within the Historic District No. 1 are on the National Register of Historic Places. The West Point Military Academy Band performed: "Woodbury Fanfare" (Anderson), "The Star Spangled Banner" (Traditional), "Ticonderoga March" (Anderson), Four movements from "Irish suite": "The Irish Washerwoman"; "The Minstrel Boy"; "The Rakes of Mallow"; "The Girl I Left Behind Me" (4 movements arranged by Anderson), plus nine compositions by Leroy Anderson - "Promenade", "Bugler's Holiday", "Clarinet Candy", "The Syncopated Clock", "Song of the Bells", "Horse and Buggy", "Blue Tango", "Serenata" and "The Phantom Regiment". The band concluded the concert with "The official West Point March" and "Sleigh Ride" by Anderson. 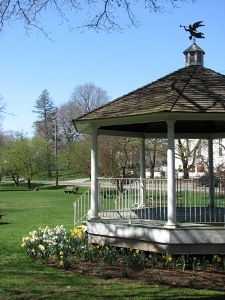 The Leroy Anderson Memorial Bandstand is owned by the Town of Woodbury. Maintenance of the bandstand and of the historic North Green is the responsibility of the Woodbury Parks and Recreation Department. The family of Leroy Anderson is grateful to the Woodbury Lion's Club and to the Town of Woodbury. 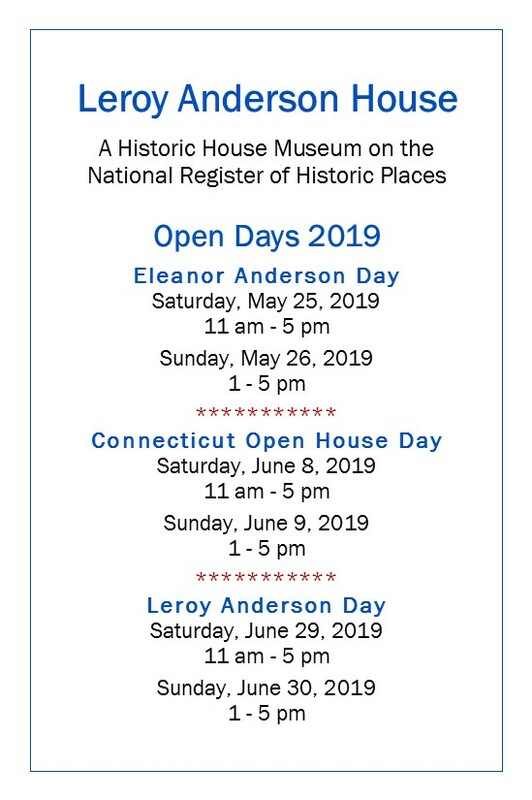 Please join the Anderson family in thanking the Lions Club and the Town for all they do to keep the bandstand and the North Green in such good condition. 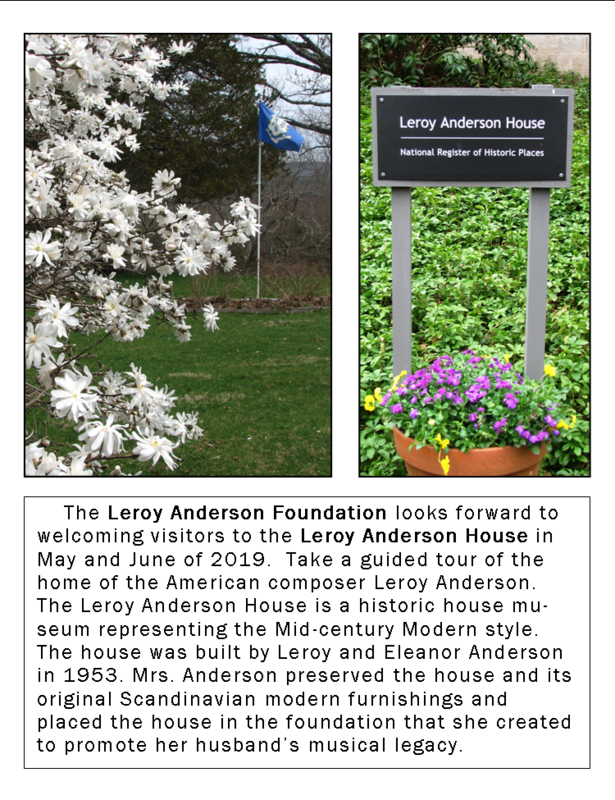 The Pomperaug Valley Garden Club is pleased to announce that the renovated garden surrounding the Leroy Anderson Memorial Bandstand on Woodbury's North Green will be named "The Eleanor Anderson Memorial Garden" in honor of Mrs. Anderson, the widow of composer Leroy Anderson and a longtime member of the garden club who died in 2014. The garden will be dedicated in a ceremony on Saturday, June 16, at 2 pm, at the Bandstand on the North Green (at the intersection of Route 6 and Route 47/Pleasant Road). The ceremony will include brief remarks, the dedication of a memorial plaque, and a short performance of music by Anderson and others. The club will provide light refreshments following the ceremony and performance. Mrs. Anderson first joined the Pomperaug Valley Garden Club in 1975 and was an active member until 2010, when she was given honorary membership status. She was active in maintenance of the award-winning Botany Trail at Flanders Nature Center and Land Trust, and co-chaired, with Adeline Cox, the club's Botany Committee from 1983 to 1987, and again from 1991 to 1994. 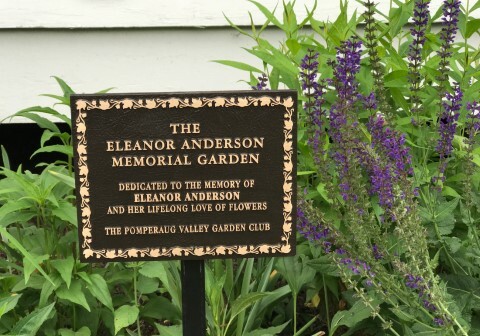 The family of Eleanor Anderson would like to thank the Pomperaug Valley Garden Club for dedicating the perennial garden at the Leroy Anderson Memorial Bandstand to the memory of Eleanor Anderson. The ceremony on Saturday, June 16, 2018 was attended by approximately 30 people on a warm and sunny day. The Pomperaug Valley Garden Club has worked hard to make the gardens on many of Woodbury's town greens and parks some of the most beautiful in Connecticut. The garden club was awarded the "HISTORIC, MEMORIAL, AND PUBLIC GARDENS AWARD OF EXCELLENCE" by the Federated Garden Clubs of Connecticut, Inc. in 2016 for a "...significant installation at the Leroy Anderson Bandstand in Woodbury" on Woodbury's historic North Green. 10 It is this garden that was dedicated to Eleanor Anderson. As a member of the Pomperaug Valley Garden Club for over 40 years, Eleanor Anderson was devoted to the Botany Wildflower Trail at the Flanders Nature Center and Land Trust. Her son Kurt Anderson of Roxbury thanked the garden club for the honor of the garden dedication and spoke of his mother's other volunteer work in Woodbury. Lili Wadsworth, formerly of Woodbury, and Eleanor Anderson's dearest friend attended the dedication along with many other friends and neighbors. Thanks also go to Selectman Bill Butterly for arranging to have the bandstand receive a fresh coat of paint in time for the dedication. Connecticut Lions Club International, District 23B, "Spirit", December 2018, Page 15; "The Sunday after Thanksgiving means the Woodbury Lions decorate the Leroy Anderson Bandstand on the town's North Green. We built the bandstand in 1986 as a legacy project, and we've been covering it in lights for Christmas every year since, a silent nod to Anderson's famous holiday song, "Sleigh Ride", which was written here in town. It's a couple of hours of camaraderie, music, and coffee and doughnuts that we look forward to every year."